Alex King believes Ben Foden is getting back to his best at Saints. The full-back was in superb form last Saturday, helping his club secure a stunning 26-15 Champions Cup win at Glasgow Warriors. Foden had been ruled out for the final few months of last season, with an ACL (anterior cruciate ligament) injury costing him a shot at the World Cup. But he was able to play a full part in pre-season and is now reaping the rewards. 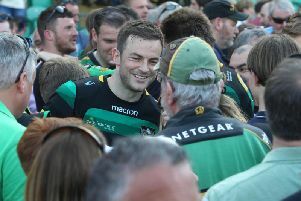 “It was great to see Ben Foden back to his best and coming into the line at pace last weekend,” Saints attack coach King said. “He’s confident and he’s running as well as I’ve seen him. Luther Burrell has also been impressed by the form of Foden, who is targeting an England recall after the appointment of new head coach Eddie Jones. Burrell said: “Ben Foden is just in outstanding form so far this season.